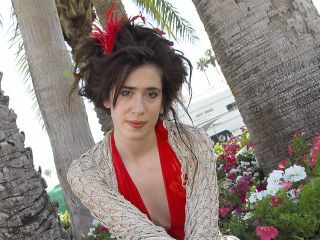 An advance promotional copy of Imogen Heap's album Ellipse has been removed from eBay after Imogen and her flock of Twitter followers campaigned to sabotage the listing. Ellipse isn't scheduled for release by Sony until late August so, after being 'tipped off' about the sale last weekend, Ms Heap was quite understandably pretty pissed off (partly because of the promo's unbroken seal: "He [the CDs recipient] hadn't even listened to it! ", she Tweeted on Sunday). Closer inspection of the listing's image revealed the recipient to be a Mr James Cabooter, music critic for the Daily Star. To cut a long story short (Stereokill and Thomas Dolby both offer a detailed unfolding of events), Imogen and her 669,000 faithful Twitter followers destroyed the listing with a mass of bids up to £10,000,000 and a torrent of complaints to eBay who eventually took it down. We should point out here that Mr Cabooter has since been absolved of all blame: "My ears have been burning," he wrote in an email to Stereokill. "I can happily confirm this is nothing to do with me." "First I heard about it was this morning thanks to a barrage of abusive emails. I've been in contact with eBay, Sony and Imogen's various contacts and rest assured the item is now off eBay. Unfortunately our post is often intercepted by people and this is not the first time it has happened to a member of our staff." "I'd appreciate if you could spread the word to salvage what remains of my reputation." Even though this particular journo is innocent, it does raise questions about the moral obligations faced by DJs and reviewers who are entrusted with these promo copies in the first place. As Thomas Dolby points out: "For as long as I've been in the music business (30+ years)… instead of coming out of the label's 80% share of the revenue from record sales, 'marketing' expenses like this [promo] came out of the artist's 12% share." "Along with satin tour jackets, bar bills at top night clubs, and in some cases, the marina fees for some radio programmer's speedboat." The case is also testament to the power of Twitter as a networking tool. Coincidentally, we placed Imogen Heap as the second most important musician you should be following on Twitter. Since first place went to Trent Reznor who has since disowned the internet, Ms Heap goes top by default.